As previously reported here, only 4 weeks out of the last 52 ending in May were colder than average in the U.S. 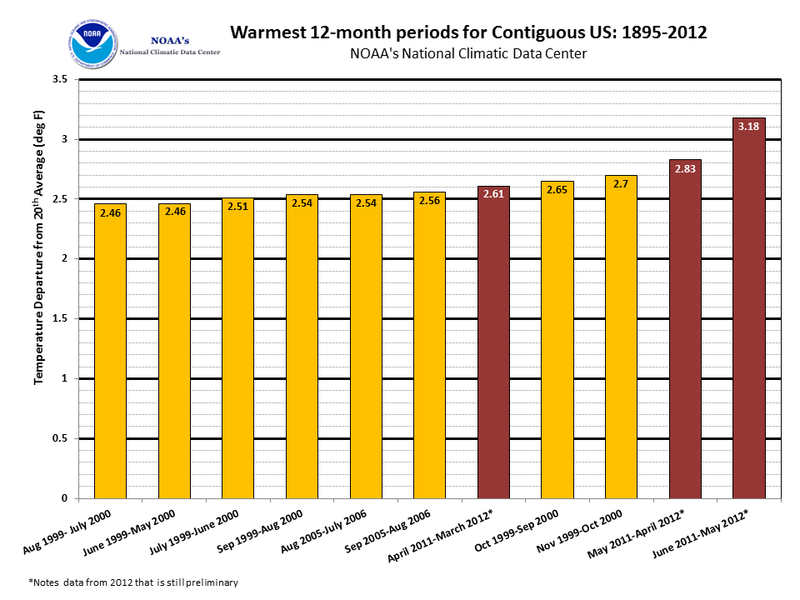 The National Climatic Data Center (NCDC) has now reported that the 12 months from June 2011-May 2012 were the record warmest of any 12-month period in U.S. climate history, surpassing by a wide margin the year ending in April. Three of the top 5 warmest 12-month intervals have now ended in each of the last 3 months. The NCDC further reports that "each of the 12 months ranked among the warmest third of their historical distribution for the first time in the 1895-present record. The odds of this occurring randomly is 1 in 531,441." 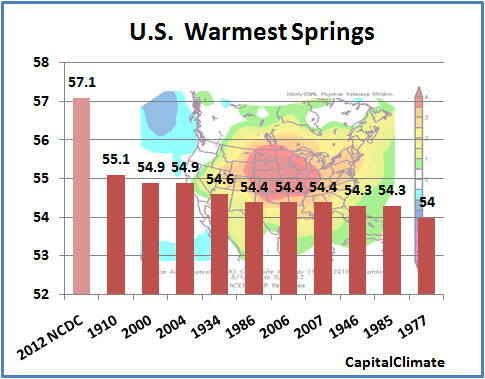 NOAA's National Climatic Data Center (NCDC) late this morning confirmed that spring 2012 (March-May) temperatures crushed the seasonal heat record, as preliminary CapitalClimate analysis had previously indicated. The final average of 57.1° was equal to the average of earlier estimates and was the largest departure from the long-term average of any season on record since national data began in 1895. As the map shows, every state east of the Rockies had a top-3 warmest spring, and 31 of those, from New England to the Northern Plains and from the Great Lakes to the Gulf Coast, had an all-time warm record. The national temperature of 57.1 degrees F during spring was 5.2 degrees F above the long-term average, besting the previous warmest spring of 1910 by 2.0 degrees F. This marked the largest temperature departure from average of any season on record for the contiguous United States. 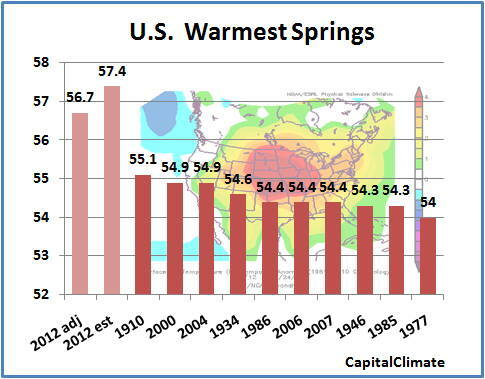 The spring of 2012 was the culmination of the warmest March, third warmest April, and second warmest May. This marks the first time that all three months during the spring season ranked among the ten warmest, since records began in 1895. Record and near-record warmth dominated the eastern two-thirds of the nation during spring. Thirty-one states were record warm for the season, and 11 additional states had spring temperatures ranking among their ten warmest. Only Oregon and Washington had spring temperatures near their average. 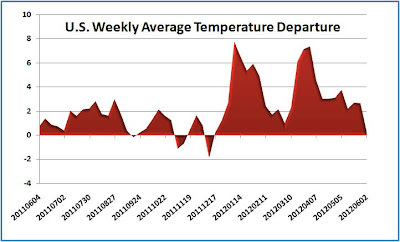 U.S. weekly average temperatures compiled by the National Climatic Data Center from National Weather Service reports show that there have been only 4 weeks in the past year that have not been warmer than the climatological normal. 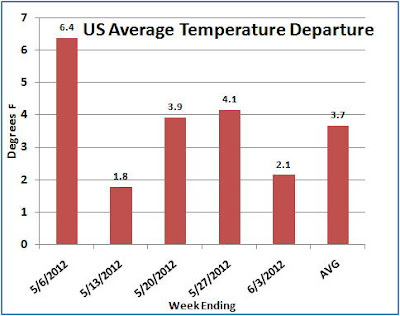 None of these has been in 2012, although the past week, ending June 2, was close, at +0.28°F. The most recent cold week ended on December 10. The only 2 consecutive cold weeks were in November. 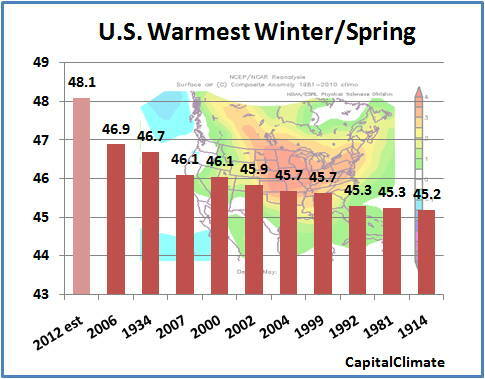 The preliminary national average temperature of 55.22° for the past year was 2.23°F warmer than climatology. 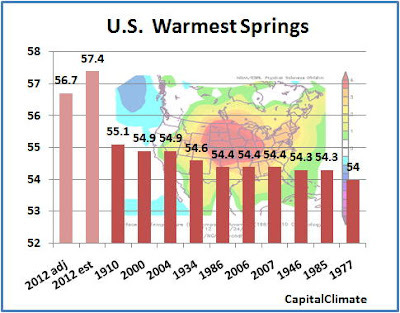 Following a near-record warm winter, the record warm spring by a wide margin in the U.S. has produced a record warm 6 months of December-May. 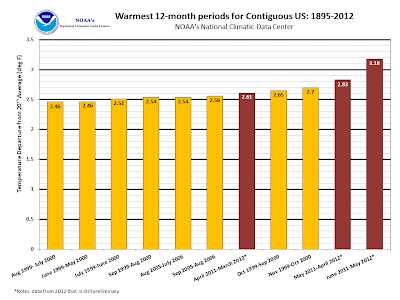 Preliminary May figures combined with the National Climatic Data Center reports for the previous 5 months yield an estimated average of 48.1°, over 1°F above the old record of 46.9° in 2006. Seven of the top 8 warmest winter-spring periods have now occurred in the last 14 years beginning in 1999. The charts to the right (click to enlarge), from the NOAA Earth System Research Laboratory, show the December 2011 to May 2012 average temperature departure from the 1981-2010 climatology and the difference between the 2011-12 average and the corresponding months for 2005-06. 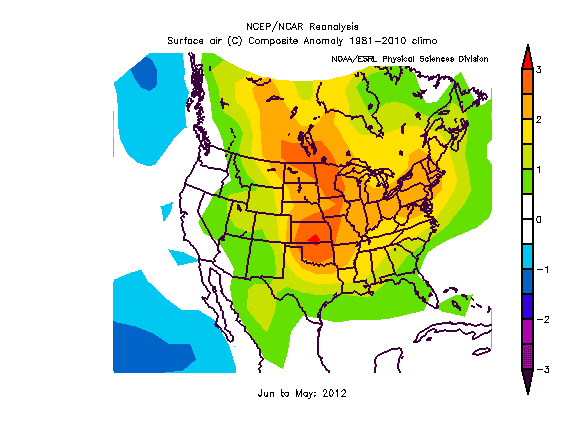 June 7, PM Update: See update for official report from NOAA/NCDC. June 4, PM Update: Using a larger subset of 237 National Weather Service stations for May 1-31, the average is 3.5°F above the 1981-2012 climatology, so it's very likely that the May average was within 0.1°C of being 2°C above climatology. 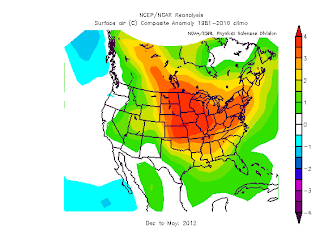 Much of the Midwest was 3.5°C or more above average, with most or all of 5 states above 4°C. 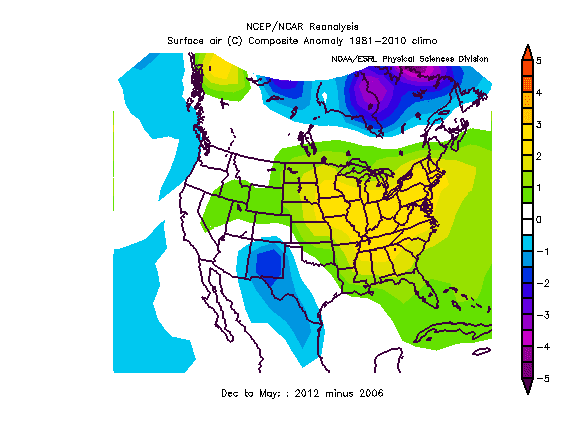 This puts the May 2012 national average temperature at 65.5°, which edges out the record warmest May of 1934 by 0.1°. Combined with the significantly above-average temperatures of March and April, it's very likely that the final spring temperature will exceed the previous warmest spring of 1910 by as much as 2.4°F. 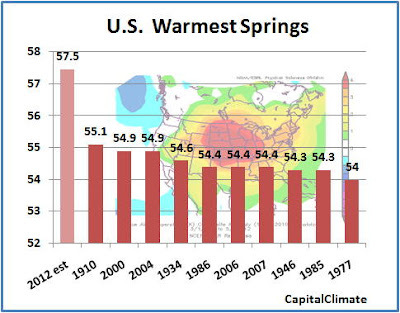 Five of the top 8 warmest springs will now have occurred in the 13 years of this century. Official U.S. temperature averages will be published by the NOAA National Climatic Data Center in about a week. Yes, Kim Martucci, weekend substitute weathercaster on WRC-TV (Channel 4) confirms that she is again pregnant, this time with her second child (and looking somewhat less red-headed on tonight's hockey-delayed broadcast).